Hexagonal shape with two side handles and cover. Length 10.25 ins handle to handle. Attractive dish with white gadrooned rim. There is some wear and a little discoloruation to the rim and the foot, also a little surface scratching inside to the base. With gilt. Cover only from the vegetable dish to fit 11.25 ins x 9 ins dish. It is gently moulded with embossed detail around the ornate finial. No backstamp. There are a couple of tiny manufacturing blemishes on the top and underneath some very minor blemishes, overall excellent condition. Fabulous octagonal dish with two ornate side handles. Backstamp: Rd no. 623294. This pattern was introduced by William Adams ..... Wm Adams England. Light crazing and a tiny chip to the inside rim of the base and the finial on the cover has a few minor signs of wear and there is some loss of glaze and colour where it joins the lid. Overall a lovely lovely dish. This is a wonderful octagonal dish with ornate side handles to the base and finial to the cover. Backstamp: Rd No 623294 This Pattern was introduced by William Adams in 1780 being a copy of a Chinese pattern and one of the first of its style produced in English pottery Wm Adams England. The base has a little minor wear underneath and some blue mottling inside. The cover is in excellent condition. Very attractive dish on wavy rim foot. The base is beautifully patterned inside and on the outside has a vignette of pattern either side. Backstamp: Adams Member of the Wedgwood Group Real English Ironstone Micratex England English Scenic Decoration completely underglaze Acid and detergent proof. Excellent condition. Blue printed backstamp. Extremely pretty hexagonal dish and cover with lovely flower finial. Backstamp Juliet Adams, Estd 1657, England. The inner rim has two tiny nicks one of which has discoloured otherwise absolutely fine. A really attractive hexagonal dish with lovely flower finial to the cover surrounded by embossed leaf pattern. Excellent condition. A lovely shape of dish, square with indented corners. Beautifully patterned both inside and out. Excellent condition. Gorgeous octagonal dish with side handles and ochre rim. No backstamp. Minor signs of wear mainly to the ochre rim and a little minor discolouration to the stilt marks inside the dish otherwise excellent condition. With gilt. Fabulous dish with ornate side handles and wonderful finial to the lid. No backstamp. A little wear to the gilt on the base and a tiny manufacturing blemish on the lid otherwise excellent condition. Absolutely gorgeous lidded dish printed in a steely blue and with gorgeous double flower finial to the cover. Backstamp: Tokio Est.1657 Adams Tunstall England Rd No 684663. Sadly lacking its cover, but this makes a lovely piece in its own right. Two cartouches of pattern to the outside and full pattern inside and to the rim. Impressed with date for 1933. Dimensions: 25.5 cm x 22 cm / 10 ins x 8.75 ins. Base has impressed date for 1933. Pattern to inside of base and two cartouches of pattern to the outside. The cover is beautifully patterned and with attractive finial. There is a very small rim chip, really only a flake to the glaze, on the cover. Lovely dish. Bone china with gilt. An extremely attractive dish printed in a mandarin blue. Backstamp: Adderley Fine Bone China England and in script H1291. A touch of wear to the gilt but overall excellent condition. Lovely dish printed in a rich shade of blue. The base is crazed but there is no discolouration, cover is superb! A fabulous very large dish printed in a subtle shade of green with ornate rich cobalt blue handles and finial highlighted with gilt. No backstamp. A few minor signs of wear, overall excellent condition. Also known as Number 6 pattern and made by Davenport. Lovely bird and floral pattern with added colour and an ochre rim. Ornate covered dish standing on a foot and with delightful moulded handles. Backstamp: Ashworth Bros Hanley England and in script pattern no. B9461 and impressed M7M. A little minor wear under the rim of the cover otherwise excellent condition. Lovely covered dish with embossed beaded detail around the rim of the base and rim of the cover. Backstamp: Ashworth Bros England Regd No 69533L. Excellent condition. Oval vegetable dish in smoky flow blue. This vegetable dish and cover has seen a fair amount of active service! The base is crazed and has associated staining. It has a small manufacturing chip under the rim which has been glazed over. the cover has light crazing but is still bright and clean however the loop handle has been off and restuck. 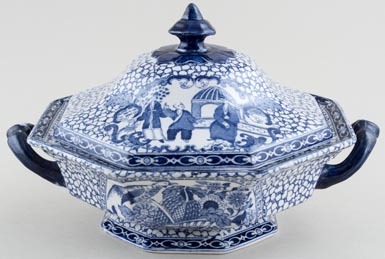 Blue printed backstamp Asiatic Pheasants B & K Ltd.
Square vegetable dish with moulded side handles and attractive finial to cover. Cover has light crazing and a small rim chip which only just shows throught.The base is crazed with staining mainy inside, so not noticeable when cover in situ'. Pretty shape of dish standing on four small feet. The cover is gently moulded and has a decorative central loop handle. The cover has light crazing otherwise in excellent condition. Attractive dish standing on four small feet and with moulded side handles. Full pattern inside and to the rim and small pattern vignettes around the outside. Backstamp: Asiatic Pheasants BW & Co. Some small manufacturing blemishes and to the outer rim and underneath a little discolouration. Lovely dish with moulded side handles and standing on four small feet. Backstamp: Asiatic Pheasant B & H. Inside there is a little surface scratching which has discoloured slightly, also a little wear and discolouration to the outer rim and underneath. Sounds much worse than it looks this is a lovely dish. Lovely dish standing on four small feet, with moulded side handles and ornate moulded handle to the cover. The dish has full pattern inside and around the rim with two vignettes of pattern on the outside and lovely floral pattern to the cover Backstamp: Asiatic Pheasant B & H. There is a very small unglazed spot on the cover probably where it touched something in the kiln, a little minor wear to the finial and elsewhere just a little minor mottling. The dish has a little very minor wear to the outer rim otherwise is in excellent condition. 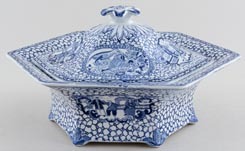 Gorgeous flow blue floral dish with cover. Backstamp: Bexley with Bisto England below a Caduceus. Excellent condition. A most unusual dish in a pattern not often seen. It does shown some minor signs of wear, particularly around the rim and to the finial and finial surround on the cover, however all in all a lovely dish. A pattern seldom seen made by Booths. This is a really lovely dish. There is a little minor discolouration around the rim of the base otherwise in superb condition. Backstamp Silicon China Made in England. Really pretty dish decorated with floral swags. A few minor signs of wear to the handles. In very good condition. Bright and clean. A lovely dish, beautifully decorated. The base has the lovely border pattern around the outside and inside delightful rural scene surrounded by the border pattern. Excellent condition. Davenport originally made British Scenery from about 1850 and when they closed, Booths acquired the printing plates and continued producing the design in the same shade of steely blue. In superb condition, virtually as new, with just an occasional line of craze in the glaze on the cover. Blue printed backstamp British Scenery over Booths and crown, with Silicon China and Made in England beneath. This is a lovely dish, beautifully decorated. The base has the lovely border pattern around the outside and inside delightful rural scene surrounded by the border pattern. It is in excellent condition. The cover is a slightly darker, softer blue than the base and is also in excellent condition. With gilt which shows signs of wear around the cover rim. This is a lovely dish printed in a rich steely blue. Fantastic central finial to the cover and scroll side handles to the base. Small minor firing fault to one of the handles. Rectangular indented dish with cover, moulded side handles and gilt line decoration to the rims. Booths bought the printing plates for this lovely Willow from Davenport, when they closed down in 1887. It is difficult to describe in words the the luscious nature of the blue and the pearly glaze. One of the most beautiful Willlows you will ever see. The gilt rim decoration is worn in places, but beautiful condition. With gilt. Round dish with ornate side handles and lovely pine cone finial to cover. Gilt is rather worn and both dish and cover are crazed with associated discolouration. Absolutely fine as a display piece. With gilt. Lovely dish with side handles and central finial to the cover. Backstamp: Booths Silicon China England and in script 9780. With gilt. 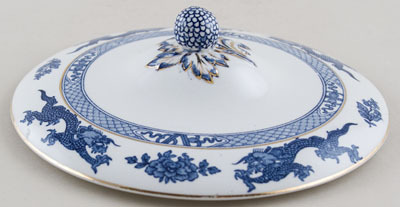 Round lid printed in a slightly steely blue, with decorative finial surrounded by embossed decoration highlighted with gilt. No backstamp. A little minor wear to the gilt otherwise excellent condition. With gilt. Ornate side handles and pretty flower finial to cover. Backstamp: Booths Made in England Dragon A8029. Underneath there is a little very minor discolouration, otherwise excellent condition. With Gilt. Lovely dish in superb condition. Pretty scroll side handles and ornate finial to cover. With gilt. Very attractive dish in this very pretty floral pattern. Backstamp: Dresden TF & FB (for TG & F Booth)and printed and raised pad registration marks. The base has light crazing with some discolouration inside and the inside rim and foot have a few nibbles. The cover has light crazing otherwise excellent condition. Oval dish with ornate side handles and central handle to the cover. A few very minor signs of wear otherwise excellent condition. Blue printed backstamp: Royal Semi Porcelain Indian Ornament Booths England. Gorgeous oval dish with ornate handles either side of the dish and to the cover. Backstamp: Semi-Porcelain Melsary Booths England, impressed Booths and Rd No 879454. Inside the dish, the stilt marks have discoloured a little otherwise excellent condition. This is a most unusual set. Two covered half moon dishes set in an oval tray. Mixed Flowers is a given, not official name for this pattern. Backstamp: Booths Silicon China Made in England. The tray has a few signs of wear. The dishes are in superb condition and the covers have light crazing. Overall a fabulous set.